Zn0.97Mn0.03O and Zn0.87Mn0.03Fe0.1O nanoparticles have been synthesized using co-precipitation technique. The obtained nanoparticles were characterized by X-ray diffraction, and transmission electron microscopy. The elemental contents of the prepared nanoparticles were determined using particle-induced X-ray emission. Besides, the oxygen content of these nanoparticles was determined using non-Rutherford backscattering spectroscopy. The electrochemical behaviour of 10 ppm nanoparticles on the corrosion of mild steel in 0.5 M HCl and 0.5 M NaCl solutions containing 1% SDS was studied using potentiodynamic polarization curve measurements and electrochemical impedance spectroscopy techniques. The mechanism of inhibition of the studied nanoparticles was discussed and explained. 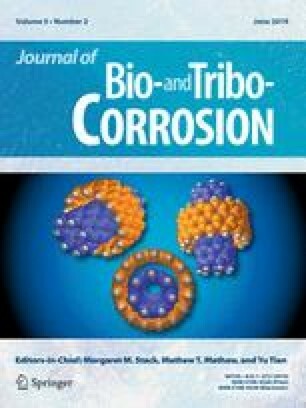 Iron containing nanoparticles enhanced the corrosion protection of mild steel in 0.5 M HCl due to the ability of Fe2+ to deposit onto metal surface. However, in neutral 0.5 M NaCl medium, both nanoparticles have approximately similar efficiency. The authors thank Dr. Mohamad Roumié the head of the accelerator Laboratory, Lebanese Atomic Energy Commission, CNRS, Beirut, Lebanon for the assistance in this work.